This article is Day #7 in a series called 31 Days of Windows 8. Each of the articles in this series will be published for both HTML5/JS and XAML/C#. You can find additional resources, downloads, and source code on our website. 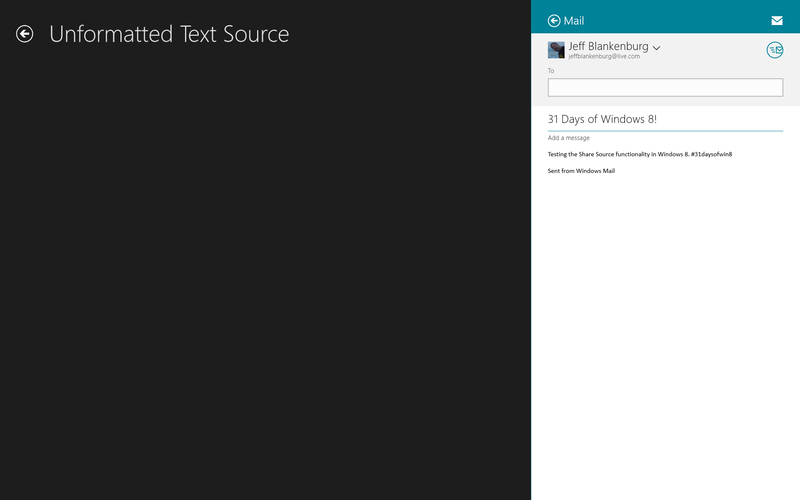 Over the past two days we’ve jumped into this new Windows 8 feature: contracts. We introduced this notion of contracts by exploring how to incorporate Settings into our applications. 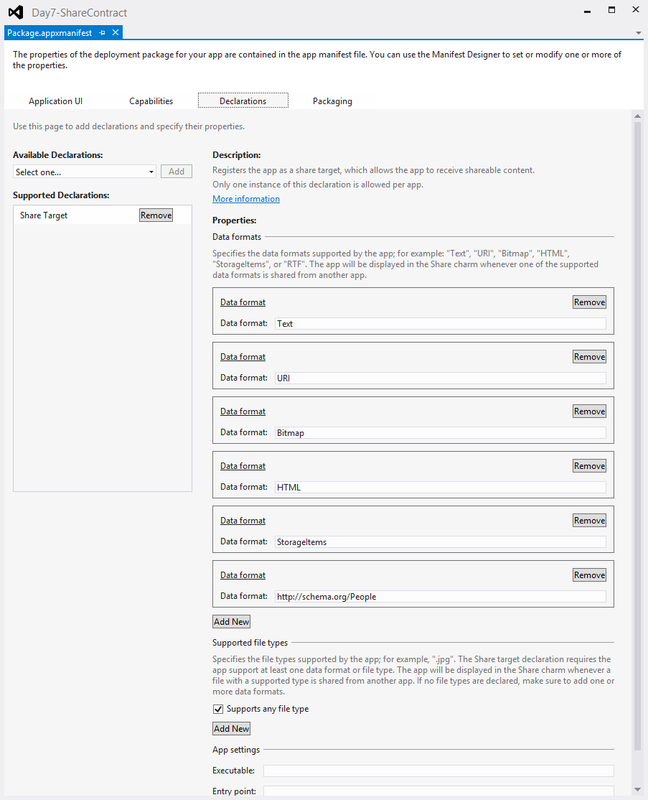 Then we explored extending our applications presence to users with Search. Today we’re going to take the next step and explore one of the features that gets both Clark and I really excited, Sharing. Prior to Windows 8, building “social” into apps was hard. Not only did you have to learn the APIs for the platform your app was targeting, but you also had to learn the APIs for Facebook, Twitter, and however many other social networks you wanted to include. That’s practically overwhelming, if not nearly impossible to do effectively. With Windows 8, we only have to worry about building our app. In fact, putting buttons in your app that say things like “Share on Social Network X” are actually discouraged in this ecosystem. Why provide a user with a Twitter button when they don’t use Twitter? Same goes for Google+, Facebook, Flickr, GitHub, or any other socially based platform. With the Sharing Contract, the user gets to be in full control. You make your content shareable, and THEY decide where and how it gets shared. 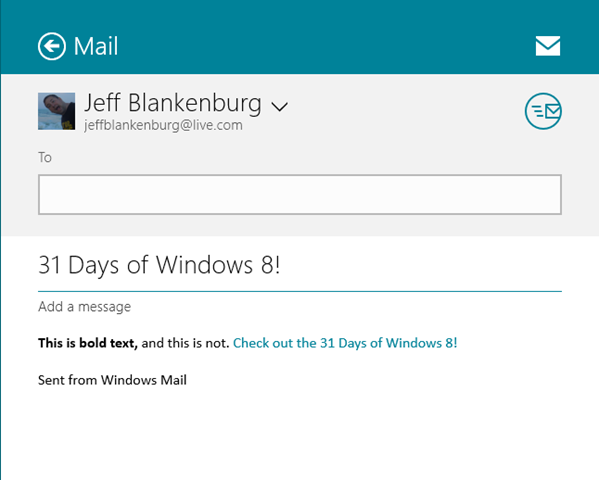 It’s an empowering feeling that is truly one of the highlights of Windows 8 for me. Sharing happens two ways, he who shares ( the source app ) and he who receives ( the target app ). This happens through a broker. Data is shared through an object called the DataPackage. In this article, we’re going to divide Share Source and Share Target into two separate sections. We are going to start with the simpler of the two scenarios, Share Source. In this scenario, we are going to show how you can share each of the 7 types of content listed above. First, we need to create a new Blank App Template, so start there. In the sample code for this article, you’ll notice that I have created a separate page for each type of data. You certainly don’t need to do that in your app, but keep in mind that you can only share one type of data at a time from any one page. Let’s start with Unformatted Text. This will be the lengthiest example for Share Source because most of the code is exactly the same for each example. I’m only going to highlight all of it here, and then I’ll focus on the stuff that is different in the successive examples. First, we need a reference to the DataTransferManager. 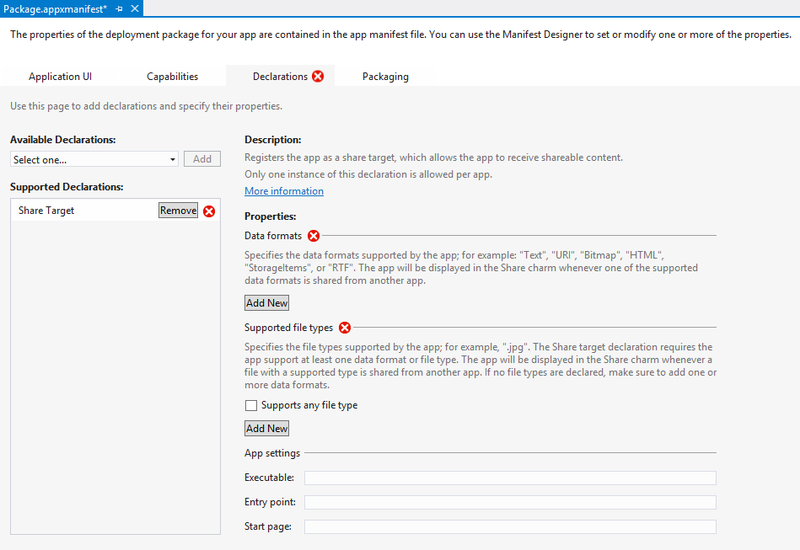 You will also need to add the Windows.ApplicationModel.DataTransfer namespace to your page. In the code below, you’ll see that I instantiate the reference to the DataTransferManager, and then create an event handler (in the OnNavigatedTo() method) for when data is requested to be shared from this page with the DataRequested() event handler. You should also notice that we set up the OnNavigatingFrom method to remove the DataRequested event when we leave the page. This is a best practice that you should incorporate in every one of your pages. Make sure you cancel any event handlers that you register. string textDescription = "This just explains what we're sharing. ";  //This is an optional value. For the rest of the data types, I will show you the contents of the dtm_DataRequested() method, but that everything else basically stays the same. string linkDescription = "This just explains what we're sharing. ";  //This is an optional value. The Mail app also went out and grabbed the actual <title> from the website and used that in the listing. Very helpful. In the unformatted text example, the Description property was not used by the Mail app. In this case, it was embedded with the link. Let’s take a look at sharing Formatted Content like HTML now. string HTMLDescription = "This just explains what we're sharing. ";  //This is an optional value. We had to treat this content slightly differently. You’ll notice that when we set our content for our DataPackage this time, we had to call the HtmlFormatHelper. This takes our otherwise ordinary string of characters, and converts it to active, working HTML markup that can be parsed and used. The initial sharing prompt looks exactly the same as it has, but you can see that our formatted HTML appears in the body of our email message. A great application of this would be for creating HTML-formatted email messages. Creating messages like that are extremely difficult for those folks that don’t already know HTML. Imagine a simple app that allowed them to create their HTML interface visually, and then they could share it to their Mail client and send it out. Someone build that. One file or many files are treated the same way in this situation, but because we are reading files from storage, there’s also a little extra code that needs to be written. If you have additional files, you’ll simply add additional logic to grab the additional files asynchronously, and add them to the List<IStorageItem> collection. We will asynchronously grab the file(s), and when the operation is complete, we will share it. string FileDescription = "This just explains what we're sharing. ";  //This is an optional value. The interesting thing to note in this situation is that previously the Mail app used our Title property as the subject of the email message. In this example, it doesn’t. I’m sure that the product team has a list of reasons why this is, but I’d vote for consistency on this one. When sharing an image file, you might want to treat it differently than just a basic file, but you also might not. In this example, we’re actually going to share our image file two different ways, so that the Target apps can use the data that they are interested in. Apps that are looking for files will be available, as will apps that are just specifically looking for Images. You can use this handy trick when you’ve got multiple types of data to share as well, not just when the same thing could be shared two different ways. You can see that we’ve called both the SetBitmap method, as well as the SetStorageItems method. In either case, the Share prompt looks identical, but the list of apps available are definitely different in each case. For example, the Mail app doesn’t accept raw images, but it does accept images as StorageItems. Give this sample code a try. I was also surprised to see that the People app doesn’t accept either type of sharing. We’ll talk later in this article about being a Share Target, and how we can accept different kinds of data. There are going to be many times where you want to share some kind of custom data. 99% of the time, it’s going to fit a standard schema, like those found on http://schema.org. You’re certainly not locked into a pre-determined schema, but make sure you understand the guidance Microsoft offers for creating your own custom data formats. The short story on sharing custom data is that you’re going to specify a DataPackageFormat, but it can be absolutely anything you want. For most purposes, you’re only likely to share custom data formats between two of your own apps, but standardizing on a standard schema certainly increases your odds of being able to share with other apps as well. Ultimately, you will specify a string that represents your data schema, and if any other app is a Target for that same specific string of characters, they will show up in the list of potential Targets. As you’ve seen throughout this section, our Title and Description continue to show up in the same place, but this time, there aren’t any apps available to share with. In the next section, we’re going to look at how we make our app capable of receiving these data types. When I first sat down to write this article, I made Share Target last because I thought that was going the be the more difficult (and lengthy) of the two. As it turns out, I’m wrong. Much of the work for being a Share Target falls in your Package.appmanifest file. Open yours to the Declarations section, and you’re likely to find a barren wasteland. What we need to do is add the Share Target declaration, by choosing it from the dropdown and clicking the Add button. Once you add the Share Target, it’s going to light up with a bunch of red X symbols. Adding a Share Target declaration isn’t enough. You also need to specify what type of Target your app is going to be. Thankfully, we can choose any/all of the formats we’ve already covered in this article. The next screenshot shows my Share Target declarations completely filled out, making my app a Target for nearly everything. Now, as we get into the code, there’s WAY more going on here than you’ll probably need for your application. I’ve built a sample application that shares and consumes every possible data type, and as such, it’s got many more lines of code than you will. 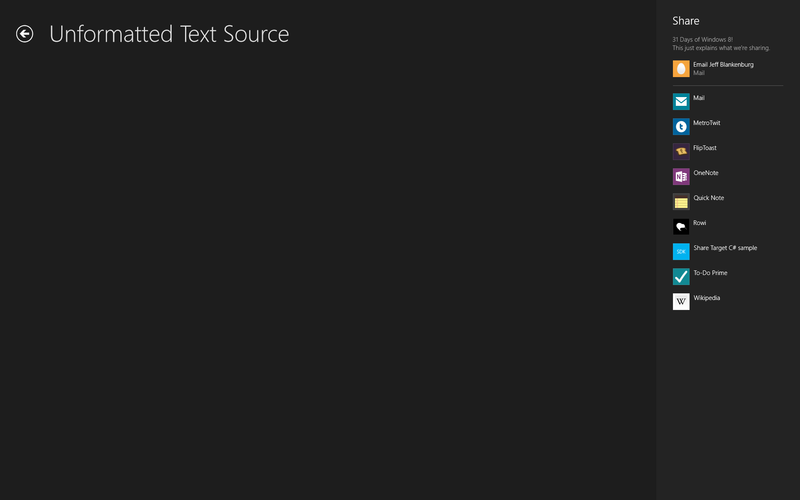 First, we need to open our App.xaml.cs file and add a new method to handle when the Share Target is activated. It is called, not surprisingly, OnShareTargetActivated. All this really indicates to the app is which page you want to have loaded when your application is targeted for sharing. This will likely be a separate page for you (not MainPage), but for my example, that’s exactly what I’ve used. Now for the big chunk of logic. I’ve added comments so that you can find the pieces you’re specifically interested in. Here’s the entire OnNavigatedTo method in my MainPage.xaml file. Remember, this logic will likely go in a seperate “SearchTarget” page in your application that has the sole responsibility of catching shared data. //IF THERE WERE IMAGES SHARED. //MOVING BACK TO THE UI THREAD, THIS IS WHERE WE POPULATE OUR INTERFACE. As you can see, each example is slightly different, depending on the type of data. 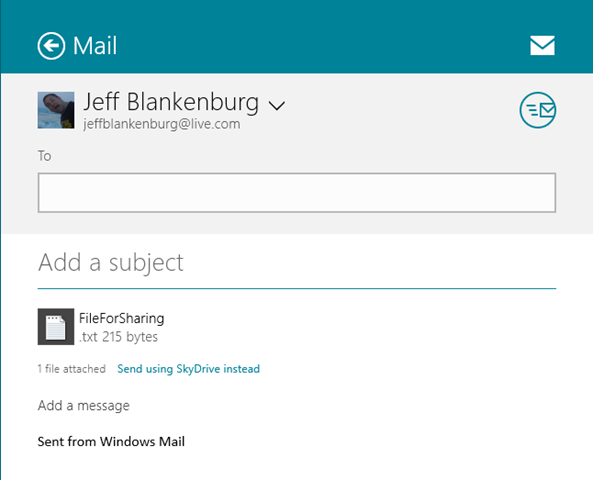 Today, we took took a very extensive look into adding Sharing into your application. The Search contract provides an amazing new paradigm for applications to interact with one another. There’s something incredibly refreshing about knowing that applications that have no idea mine exists can still communicate with one another. I hope you’ll take the opportunity to share and consume the data that makes sense for your application. Tomorrow, we’re going to focus on storing data, both locally on the user’s device, as well as roaming that data in the cloud. See you then! But only the image shows up using MetroTweet with an empty message body. Using “SetText()” doesn’t help eather. On the Share Target, is it possible to only accept specific URIs, i.e. links to a certain domain, or links to files with a specific file type? I don’t believe so. How would this be beneficial to the user? The name package does not exist in the current context. Jeff, thank you so much for the great articles. Its so much easier to build an app from scratch, just adding what you need rather than having to wade through the code in the MS templates and try to work out what you don’t need. I have the example on this page running as expected, however we do not seem to have a method to display the received files (storage items) after we send them. 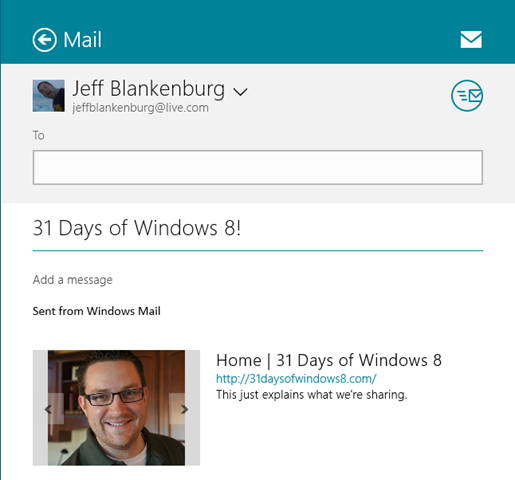 one question: is it possible to send an email to a specific recipient through share contract? Is there a way for one button to send an automatic email that bypasses having to use the side bar.